Reciting all the messianic nicknames given to Barack Obama, such as "The One," "The Savior," and "The Messiah," NBC's Matt Lauer, on Monday's Today show, asked the Democratic presidential nominee how he will "manage" such great "expectations." During an interview, aired in two parts in the first hour of Today, Lauer rarely hit Obama with a tough question, instead choosing to focus on campaign highlights such as all the recent endorsements for Obama from Colin Powell to the Washington Post. Lauer read from the newspaper endorsements, to get Obama to bash Sarah Palin. As for Powell, Lauer repeatedly pestered Obama to get the former Secretary of State to join him on the campaign trail as he eagerly inquired: "Do you then say, 'Secretary Powell it would be great to see you out on the campaign trail over these next 16 days? '...Did you ask him?" Good Morning America journalists celebrated the endorsement of Senator Barack Obama by former Secretary of State Colin Powell on Monday's program. An ABC graphic for reporter John Berman's segment did not hold back. It asked: "Obama's Best Weekend Ever? Powell and Donors Boost Obama." Co-host Diane Sawyer teased the story by announcing: "This morning, Senator Obama's banner weekend: Record breaking crowds, cash and the endorsement heard around the world." Introducing Berman, Sawyer called Powell's endorsement, which occurred on Sunday's Meet the Press, a "booster rocket." On Monday's CBS Early Show, co-host Maggie Rodriguez discussed former Secretary of State Colin Powell's endorsement of Barack Obama with Face the Nation host Bob Schieffer: "To hear Colin Powell say that he's not sure John McCain can handle the economy, he's not sure if Sarah Palin is qualified, he doesn't like the nasty tone of this campaign, how significant was that, Bob?" Schieffer replied: "...this just adds to the good news that Barack Obama's been getting lately. Things seem to be breaking his way. This just adds to the momentum." Rodriguez then followed up by wondering: "What do you think privately the McCain campaign is making of this endorsement?" At that point, Schieffer proclaimed: "Well, I'm sure they don't like it but, you know, this is -- what Colin Powell said yesterday and why it was so riveting to hear him, he was saying aloud what a lot of Republicans are saying privately, I think, or at least what I've heard some Republicans tell me. They think the pick of Sarah Palin reflects on John McCain's judgment, they think the campaign has turned too nasty and is not inclusive. I think Colin Powell said aloud yesterday what some Republicans, at least, are saying privately." Twisting in the knife. While Barack Obama gets gushing coverage (ABC's Jake Tapper marveled on Monday's World News over Obama's "rather unbelievable weekend where he had his largest campaign crowd ever -- 100,00 in St Louis -- he announced record-breaking fundraising, $150 million in September and, of course, he secured the endorsement of that Republican Secretary of State, retired General Colin Powell"), ABC and CBS took gratuitous shots at John McCain and Sarah Palin, twisting upbeat events and a Joe Biden gaffe into negatives for the Republican ticket while NBC skipped over Biden's warning Obama's election will invite "an international crisis." Not that it's any big surprise given his well-established liberal views and contempt for conservative policies, but in what is an unusually blatant abandonment of basic journalistic pretenses, CNN on Sunday -- and Newsweek in this week's issue -- provided time and space for Fareed Zakaria to outline why he will be voting for the "steady and reasoned" Barack Obama. Along the way, he denigrated Sarah Palin as "a rabble-rousing ultraconservative." At the end of his Sunday (October 19) CNN program, Fareed Zakaria: GPS, Zakaria told his viewers of his choice, concluding: "John McCain represents the best of America's past, and Barack Obama the hope of the future -- the hope of a country that can make big changes and live out one of its greatest promises, of equal opportunities for all Americans, of every caste, creed and color. And America has always been a country that looks forward. So, I will be voting for Barack Obama on election day this year." The Editor of Newsweek International was more explicitly hostile to McCain and Palin in the October 27 domestic edition of Newsweek where, in a piece titled "The Case for Barack Obama," he made clear his disagreement with conservative policies and his left-wing view of past campaigns. 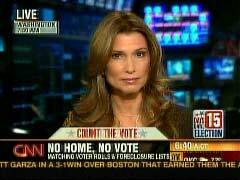 CNN correspondent Carol Costello's report on Monday's American Morning program unquestioningly repeated a claim by Democrats in Michigan that Republicans in the state would disqualify voters affected by home foreclosures. She began her report by phrasing the accusation this way: "Lost your house to foreclosure? Democrats in Macomb County, Michigan, say beware -- Republicans, they say, want to make sure you lose your vote, too." On Monday's Good Morning America, in a fact check of John McCain's statement that Barack Obama "gives away your tax dollars to those who don't pay taxes," reporter Jake Tapper cited the Tax Policy Center's analysis of the McCain and Obama tax cuts to stamp McCain's charge "false." Tapper: "Obama's tax cuts only go to people who work, so by definition, it's not welfare. Some working people eligible for Obama's tax cut make so little, they do not pay income taxes. But they do pay payroll taxes and other taxes." In other words, McCain would have been accurate if he'd said "gives an income tax cut to those who don't pay income taxes -- and pays for it by raising income taxes on those who are already shouldering more than half of the nation's income tax burden." But Monday's piece illustrated the liberal media's penchant for analyzing tax proposals according to a liberal yardstick -- who gets how big a check from the government -- rather than by analyzing how the rival tax policies will contribute to greater prosperity (by helping or hurting economic growth, rewarding or punishing job creation, etc.). With 18 days to go in the presidential race, Friday's Today show lurched to the far left and actually devoted five minutes (and space on MSNBC.com) to leftist author Naomi Wolf and her theory that under President Bush, America is undergoing a "fascist shift." Co-host Meredith Vieira treated Wolf with skepticism, questioning her assertions that we're in danger of a "police state," or a standing army overlooking American citizens, suggesting she might be "fear-mongering" to get Barack Obama elected with theories of a McCain-Palin police state, just as the McCain campaign has been accused of exploiting fear. But if years ago, an author suggested President Clinton was leading us into dictatorship, would NBC offered them five minutes, or simply ignore it as undignified? Reciting all the messianic nicknames given to Barack Obama, such as "The One," "The Savior," and "The Messiah," NBC's Matt Lauer, on Monday's Today show, asked the Democratic presidential nominee how he will "manage" such great "expectations." During an interview, aired in two parts in the first hour of Today, Lauer rarely hit Obama with a tough question, instead choosing to focus on campaign highlights such as all the recent endorsements for Obama from Colin Powell to the Washington Post. In the later portion of the interview Lauer recounted the biblical descriptions of Obama: "People have called you 'The Savior,' 'The Messiah,' 'The Messenger of Change.' The expectations have been raised to such a level. Some people say you're partly responsible because of your confident attitude. If you are, as you just say, lucky enough to be elected the next President are you going to have to consciously manage expectations, during the first several months of your administration?" In the first portion of the interview Lauer read from the newspaper endorsements, to get Obama to bash Sarah Palin: "The Washington Post in endorsing you, they were very tough on John McCain saying, 'Anyone who talks about national security and says he feels as deeply about it couldn't have chosen Sarah Palin as someone who is a heartbeat away from the presidency.' And I know you've been asked it, but Senator I've never heard you come right out and say, is she qualified to be President today?...Even the Chicago Tribune, historically a very conservative paper from your hometown, in endorsing you, was critical of McCain, saying, 'Sarah Palin is not ready.'" As for Powell, Lauer repeatedly pestered Obama to get the former Secretary of State to join him on the campaign trail as he eagerly inquired: "Do you then say, 'Secretary Powell it would be great to see you out on the campaign trail over these next 16 days? '...Did you ask him?" At one point Lauer suggested to Obama that, "political strategists" say Obama should just "get on a bus," "simply waving out the window," and "avoid interviews with guys like me." Well given the softball nature of Lauer's interview that advice would've been downright foolish for Obama to follow. MATT LAUER: Now to "Today on the Trail," and an exclusive interview with Barack Obama. On Sunday I caught up with him in the battleground state of North Carolina and I started by asking him about Colin Powell's endorsement and if the General had any advice or given him any advance notice. BARACK OBAMA: No. You know we had obviously sought his endorsement for a long time. This is exactly what he told me. He said, "Barack I know you, I know John McCain. You're both friends of mine. I think you're both fine public servants. I think that this election is so important that I'm just gonna watch what you guys do. I'm not gonna make a decision early. I want to see how people respond. I'm gonna watch the debates. And I'll make a decision after that." And I did not speak to him until after he appeared on "Meet the Press." Which begs the question, as you talked to him afterwards, to thank him, I would imagine. LAUER: Do you then say, "Secretary Powell it would be great to see you out on the campaign trail over these next 16 days?" OBAMA: You know I won't lie to you I would love to have him at any stop he wants to participate in. LAUER: Did you ask him? OBAMA: I, I did. And, and I think that, you know, this is an example of why General Powell is, is admired. He said, "Look, I'm not a politician and I don't want to go out there and hit the stump. That's just not what I do. I think it's best for you and John McCain to duke it out." Obviously if, if he wants to show up he's gonna have an open invitation. LAUER: He told Tim Russert back in 2007 he really didn't have any intention of getting back into politics, at least in, for an elected office. LAUER: -for the call to serve." LAUER: Which also begs the question would you like to find a role for him if you're lucky enough to be elected? OBAMA: Well I think here, here's what I can say for certain. He will have a role as one of my advisers. He's already served in that function even before he, he endorsed me. Whether he wants to take a formal role, whether there's something that's a good fit for him, I think is something that he and I would have to discuss. LAUER: Let me ask you about another recent endorsement. The Washington Post in endorsing you, they were very tough on John McCain saying, "Anyone who talks about national security and says he feels as deeply about it couldn't have chosen Sarah Palin as someone who is a heartbeat away from the presidency." And I know you've been asked it, but Senator I've never heard you come right out and say, is she qualified to be president today? OBAMA: I am going to let the American people decide on that. Frankly I just don't know enough about Sarah Palin. I haven't heard a long discussion about foreign policy. 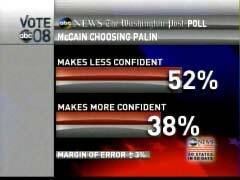 LAUER: -was critical of McCain, saying, "Sarah Palin is not ready." OBAMA: Look I'm running against McCain/Palin. Anything I say about Governor Palin will be seen through that lens. I don't need to add to people's assessments. Let the voters and observers make their own judgments in terms of who's qualified. LAUER: Let's talk about Iraq. Iraqi officials and U.S. officials are negotiating a deal, and they're pretty close apparently, where U.S. troops would be withdrawn from Iraq at the end of 2011. LAUER: -as a date. So does that piece of paper, if it's formalized, become meaningless if there's a Barack Obama presidency? OBAMA: No I don't think it becomes meaningless. LAUER: The Washington Post, again, in endorsing you, did say that your call for defined time lines to get the troops out was, perhaps, a critical flaw. And, and that it could cost us the security that has been hard fought over this last year. OBAMA: Keep in mind, as commander-in-chief, my job will be to keep the American people safe. Which means that if I ever make a determination that the American people will be safer by me making adjustments, I will make those adjustments because that's my job. My assessment, right now, is that in 16 months we can have our combat troops out. We will still have a residual force there. LAUER: When you and the smart people in your campaign get together on the plane or wherever and you crunch the numbers and you look not only at the national polls but state-by-state in the battleground states, do you see a path to victory for John McCain? OBAMA: There's no doubt. I mean I, we think that the race will tighten, just because that's what happens at the end of campaigns. They always have. Even when there are substantial leads. And in each of these battleground states you have got a lot of close races. One of the messages that I've had to my team, is that we don't let up. We do not let up. LAUER OFF-SCREEN: With just over two weeks until Election Day, on the trail, Senator Obama says his campaign is still making it's case to voters and hasn't forgotten a lesson from the primaries. OBAMA: You remember we had those big leads. We had gotten 11 wins in a row against Senator Clinton. Then there was this of "okay things are kind working out," and, and thought that we could just ride momentum and we ended getting our head handed to us. Every time we've gotten into trouble in this campaign it's because we started trying to play ball-control offense. LAUER: Senator Barack Obama on the campaign trail in North Carolina. We're gonna have more of that interview in our next half-hour, including what kind of sacrifices Americans will have to make if and when he's elected. LAUER TEASING SEGMENT: Coming up I'm gonna ask Senator Obama what sacrifice, specific sacrifice he might ask the American people to make if he's elected based on these tough economic times. Plus he'll talk about his emotional state, just two weeks now, before the nation chooses the next president. 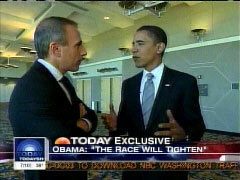 MATT LAUER: But first let's have more of this exclusive interview with Barack Obama. On Sunday I sat down with the Democratic nominee on the campaign trail in North Carolina and with the nation caught in an economic tailspin and in fighting wars in Iraq and Afghanistan I asked the senator what he would expect of all Americans if he's elected. Could you give me one concrete sacrifice, that as president, you would look to the American people and say, "you must make this sacrifice." BARACK OBAMA: On energy we are going to have to completely change our energy economy. And there are gonna be a whole bunch of changes that have to be made. Everything from how we build our buildings, to how we deal with our transportation sector, to retrofitting our power plants for how we produce electricity. All those things are gonna require not only government action they're gonna have to require individual action. OBAMA AT A RALLY: I stand before you today to announce my candidacy for President of the United States of America! LAUER: You declared you're running for President, February 10th, 2007. Since then, Senator, the country and the world have changed dramatically. Perhaps Iraq is, is the best news. But Afghanistan is less stable. The economy is in disastrous straits. You've got housing problems, energy problems, unemployment problems. Pakistan, Iran. A resurgent Russia. Is this still the same job that you signed on for? OBAMA: I anticipated, and the reason I wanted to run, was because I felt there, there, there was gonna be a transitional moment in America. That we had sort of come to a dead end in, in the economic theories that were governing. In the foreign policy that the Bush administration had taken to its logical and I think unproductive conclusion. So I knew there was gonna be a shift. And that the next president would have to create a new economic approach and a new foreign policy approach. I didn't expect that the wheels would come off so badly on both fronts. LAUER: This idea that you are, "The One," Oprah's words. LAUER: Yeah, yeah "That one," John McCain's words. People have called you "The Savior," "The Messiah," "The Messenger of Change." The expectations have been raised to such a level. Some people say you're partly responsible because of your confident attitude. If you are, as you just say, lucky enough to be elected the next president are you going to have to consciously manage expectations, during the first several months of your administration? OBAMA: Yes. Even before I'm sworn in. Not in terms of what I think we can accomplish long term but I think it's very important to understand that we're not going to reverse all these problems overnight. OBAMA AT A RALLY: God bless you! God bless the United States of America! LAUER: Right now with two weeks to go, where are you emotionally? OBAMA: When I get this close, with two weeks away, I try not to project forwards or backwards too much. I try to just stay focused on what will I have to do today, to deliver the message to make sure that our organization is working. LAUER IN STUDIO: He says when he lies in bed at night he allows himself to daydream about both possible outcomes - winning and losing. MEREDITH VIEIRA: And possibly losing. Interesting, interesting. Good Morning America journalists celebrated the endorsement of Senator Barack Obama by former Secretary of State Colin Powell on Monday's program. An ABC graphic for reporter John Berman's segment did not hold back. It asked: "Obama's Best Weekend Ever? Powell and Donors Boost Obama." 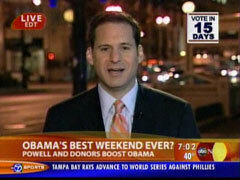 Co-host Diane Sawyer teased the story by announcing: "This morning, Senator Obama's banner weekend: Record breaking crowds, cash and the endorsement heard around the world." Introducing Berman, Sawyer called Powell's endorsement, which occurred on Sunday's Meet the Press, a "booster rocket." Berman also highlighted the fact that Obama's campaign has a "bank account that swelled by a record-shattering $150 million." Of course there was no mention of the influence of money in politics or the Democratic presidential candidate's now broken pledge to take public financing. In a follow-up segment, former Democratic operative-turned journalist George Stephanopoulos appeared to effusively describe the nod by Powell as "huge" and state, "It's a real signal to moderate Republicans and independents that Barack Obama is okay." DIANE SAWYER: This morning, Senator Obama's banner weekend: Record breaking crowds, cash and the endorsement heard around the world. COLIN POWELL: He has met the standard of being a successful president, being an exceptional president. SAWYER: The Republicans come roaring back with tough allegations and some slide splitting antics on Saturday night. SAWYER: Because as we said, as Robin just said, it's two years of campaigning and now 15 days before America votes. And Senator Obama got a booster rocket from none other than Republican former Secretary of State Colin Powell this weekend, a Republican and a friend of John McCain. ABC's John Berman is in Chicago with more on that. John? JOHN BERMAN: Good morning, Diane. Well, Obama aides swear the senator didn't know for sure about the Colin Powell endorsement until he watched it on television. That's a heck of a way to wake up in the morning and an aggressive way to start this big 15 day push until the election. It was a weekend of big numbers for Barack Obama, a crowd of more than 100,000 in St. Louis. SENATOR BARACK OBAMA: All I can say is wow. BERMAN: A campaign bank account that swelled by a record-shattering $150 million. But the biggest number might have been one, one big endorsement. OBAMA: I'm beyond honored. I'm deeply humbled to have the support of General Colin Powell. BERMAN: The retired four-star general and Secretary of State under George W. Bush was effusive in his phrase. POWELL: I think we need a transformational figure. I think we need a president who is a generational change. And that's why I'm supporting Barack Obama. POWELL: I found that he was a little unsure as to how to deal with the economic problems that we were having. BERMAN: On the tone of McCain's campaign. POWELL: To focus on people like Mr. Ayers, these trivial issues, for the purpose of suggesting that somehow Mr. Obama would have some kind of terrorist inclinations, I thought that was over the top. BERMAN: McCain did his best to brush off the sting of the news. SENATOR JOHN MCCAIN: And I'm also very pleased to have the endorsement of four former secretaries of state. BERMAN: And as for McCain's running mate, Governor Sarah Palin, Powell also had harsh words. POWELL: I don't believe she's ready to be president of the United States, which is the job of the vice president. BERMAN: Palin, meanwhile, kept up her attacks. Continuing to insist that Obama's tax policies will lead to a slippery slope. SARAH PALIN: Barack Obama calls it spreading the wealth. Joe Biden calls higher taxes patriotic. But Joe the plumber and Ed the Dairyman, I believe that they think it sounds more like socialism. BERMAN: Meanwhile, in an almost surreal moment, McCain seemed serene when asked if he ever thought about defeat. MCCAIN: I've had a wonderful life with a wonderful family and daughters and sons that I'm so proud of and a life that's been blessed. I'm the luckiest guy you have ever interviewed and will ever interview. I'm the most fortunate man on earth and I thank you God for it every single day. BERMAN: Obama is on his way to Florida today where he'll share a stage tonight with Hillary Clinton. It's the first time they've campaigned together in months. Robin? On Monday's CBS Early Show, co-host Maggie Rodriguez discussed former Secretary of State Colin Powell's endorsement of Barack Obama with Face the Nation host Bob Schieffer: "To hear Colin Powell say that he's not sure John McCain can handle the economy, he's not sure if Sarah Palin is qualified, he doesn't like the nasty tone of this campaign, how significant was that, Bob?" Schieffer replied: "...this just adds to the good news that Barack Obama's been getting lately. Things seem to be breaking his way. This just adds to the momentum." Rodriguez then followed up by wondering: "What do you think privately the McCain campaign is making of this endorsement?" At that point, Schieffer proclaimed: "Well, I'm sure they don't like it but, you know, this is -- what Colin Powell said yesterday and why it was so riveting to hear him, he was saying aloud what a lot of Republicans are saying privately, I think, or at least what I've heard some Republicans tell me. They think the pick of Sarah Palin reflects on John McCain's judgment, they think the campaign has turned too nasty and is not inclusive. I think Colin Powell said aloud yesterday what some Republicans, at least, are saying privately." To her credit, Rodriguez did make mention of tightening national polls: "Barack Obama raised $150 million last month, Bob, but even so, the polls show that his lead is actually shrinking. John McCain is saying 'I still have a chance here.'" Schieffer admitted: "Well -- oh, I think John McCain does still have a chance." But he quickly added: "As for that money, though...That is just a staggering sum. Think of this. $150 million raised in one month... Money is still an overwhelming factor in politics. This was a very important thing that happened." While teasing the segment at the top of the show, fill-in co-host Chris Wragge observed: "Incredible to hear Colin Powell say that John McCain's campaign not only bad for the country, but also bad for the country's reputation around the world." While introducing a report by correspondent Jeff Glor, which proceeded the discussion with Schieffer, Rodriguez announced: "...as we begin the final two weeks of the presidential race, Barack Obama's campaign is stronger than ever." In his report, Glor furthered the theme of the race being over: "Barack Obama's front running campaign was propelled by three more big numbers over the weekend. 150 million, the staggering amount his campaign raised in September...A hundred thousand, the number of people Obama drew to a St. Louis rally on Saturday...And finally, one, as in the one endorsement that got everybody's attention, from Republican Colin Powell...Who called Obama's campaign 'transformative.'" Glor went on to describe Powell's endorsement: "Powell denied making the pick based on race, but did knock the McCain campaign, insisting attacks on Obama were over the top and indicating Sarah Palin is under-qualified." MAGGIE RODRIGUEZ: The last two full weeks, as the presidential race leads into the final stretch and Obama picks up a coveted endorsement. COLIN POWELL: I think he is a transformational figure and for that reason, I'll be voting for Senator Barack Obama. RODRIGUEZ: But can Colin Powell's choice make a difference? RODRIGUEZ: Hard to believe it's 15 days till election day after this long year. RODRIGUEZ: We only have two weeks and it would appear that things are working out for Barack Obama. He got this coveted endorsement from Colin Powell, he raised a record $150 million last month, but the polls show that his lead is actually shrinking and John McCain says don't count me out just yet. WRAGGE: Incredible to hear Colin Powell say that John McCain's campaign not only bad for the country, but also bad for the country's reputation around the world. MAGGIE RODRIGUEZ: But first, as we begin the final two weeks of the presidential race, Barack Obama's campaign is stronger than ever. Early Show national correspondent Jeff Glor's in St. Louis. Good morning, Jeff. JEFF GLOR: Hey Maggie, good morning to you. One of the reasons we're here in St. Louis is because Missouri is a state that's voted for the winner in 25 of the last 26 presidential elections. Both campaigns want to win here, both campaign's think they can win here. John McCain will be here today and Barack Obama just left. Barack Obama's front running campaign was propelled by three more big numbers over the weekend. 150 million, the staggering amount his campaign raised in September, almost half of what John Kerry raised in his entire campaign four years ago. A hundred thousand, the number of people Obama drew to a St. Louis rally on Saturday. BARACK OBAMA: What a spectacular sight. 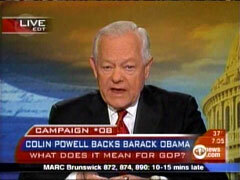 GLOR: And finally, one, as in the one endorsement that got everybody's attention, from Republican Colin Powell. COLIN POWELL: I think we need a president who is a generational change and that's why I'm supporting Barack Obama. POWELL: I think Senator Obama has captured the feelings of the young people of America and is reaching out in a more diverse, inclusive way across our society today. GLOR: Powell denied making the pick based on race, but did knock the McCain campaign, insisting attacks on Obama were over the top and indicating Sarah Palin is under-qualified. POWELL: Now that we have had a chance to watch her for some seven weeks, I don't believe she's ready to be President of the United States, which is the job of the vice president. GLOR: McCain, calling Powell a friend, said the endorsement wasn't a surprise. And embraced the game of catch-up he's now playing. JOHN MCCAIN: Are we behind? Sure. I'm the underdog. We're going to be in a tight race and we're going to be up late on election night. GLOR: Palin, in Roswell, New Mexico, took a different approach. Charging Obama's economic policies were alien to the American way of life. SARAH PALIN: Friends, now is no time to experiment with socialism. GLOR: We mentioned that John McCain will be here in St. Louis today. Barack Obama will be campaigning with Hillary Clinton in Florida. Maggie. RODRIGUEZ: They're going after the bellwethers. CBS's Jeff Glor in St. Louis, thank you. Joining us now is Bob Schieffer, CBS News chief Washington correspondent and host of Face the Nation. Good morning, Bob. RODRIGUEZ: To hear Colin Powell say that he's not sure John McCain can handle the economy, he's not sure if Sarah Palin is qualified, he doesn't like the nasty tone of this campaign, how significant was that, Bob? BOB SCHIEFFER: Well, I've never thought endorsements are game-changers but this just adds to the good news that Barack Obama's been getting lately. Things seem to be breaking his way. This just adds to the momentum. I don't think it's going to change the election in any way, but I think it's very good news for him. RODRIGUEZ: What do you think privately the McCain campaign is making of this endorsement? SCHIEFFER: Well, I'm sure they don't like it but, you know, this is -- what Colin Powell said yesterday and why it was so riveting to hear him, he was saying aloud what a lot of Republicans are saying privately, I think, or at least what I've heard some Republicans tell me. They think the pick of Sarah Palin reflects on John McCain's judgment, they think the campaign has turned too nasty and is not inclusive. I think Colin Powell said aloud yesterday what some Republicans, at least, are saying privately. SCHIEFFER: Well -- oh, I think John McCain does still have a chance. As for that money, though, and what you saw yesterday, I mean, given the endorsement, given a choice between the endorsement and the money, I think Barack Obama, and I think most politicians, would take the money. That is just a staggering sum. Think of this. $150 million raised in one month. The previous record was $66 million raised the month before and it, too, was raised by Barack Obama. Money is still an overwhelming factor in politics. This was a very important thing that happened. RODRIGUEZ: I like the quote in the Wall Street Journal this morning. Someone said that John McCain is 'in a shouting match with a man who has a megaphone.' That's tough to compete with. SCHIEFFER: It's going to be very, very difficult. I think the McCain campaign has made a command decision that the best chance they now have is simply to convince voters that Barack Obama is a far left, big government liberal, who's going to raise their taxes and John McCain is not. Now, the Obama people will tell you that is flat out wrong on all counts, but from what you hear and what you were hearing all day yesterday, that seems to be the attack that John McCain will take in these last days. RODRIGUEZ: Bob Schieffer, always appreciate you being on. Thank you. ABC reporter Ron Claiborne cited McCain's "concentrated attack on Obama as not just a tax raiser, but someone whose policies are socialist. McCain never utters the S-word himself. That's left to his running mate." But, he warned, "Palin may be a damaged carrier of the McCain message." Claiborne then paired her Saturday night success with a negative poll finding as he noted "her appearance this weekend on Saturday Night Live was a boost for the show's ratings, but an ABC News poll finds that 52 percent of voters said McCain's choice of Palin made them less confident of his judgment." Over on the CBS Evening News, Chip Reid highlighted how a CBS News poll determined "over the last month, 23 percent of voters say their opinion of McCain has gotten worse. Why? 32 percent of those blame his attacks on Obama." Reid proceeded to bury the Biden misstep under a McCain attack: "Late today, McCain added a new attack to his stump speech, seizing on a recent remark by Obama running mate Joe Biden who suggested that foreign powers would create an international crisis to test the mettle of a President Obama." ABC's World News didn't mention Biden's suggestion, at a Sunday fundraiser in Seattle, that the election of Obama will lead to "an international crisis," though Tapper put it in his blog, and only the NBC Nightly News aired any audio of Biden -- though edited to avoid airing the more damaging portion. But instead of airing that prediction of how Obama's election will lead to a crisis, Andrea Mitchell's NBC Nightly News story featured a clip which painted Obama as tough: "They're going to want to test him, just like they did young John Kennedy. They're going to want to test him. And they're going to find out this guy's got steel in his spine." RON CLAIBORNE: ...In his latest campaign mantra, McCain once again invoked Joe the Plumber as someone he says would have his taxes raised by Obama. This despite questions whether Joe Wurzelbacher would really face a tax increase under Obama's proposals. In Columbia, he met with some small business owners who McCain claims will also suffer under Obama's tax proposals, and his campaign invited the public to send him 30-second home videos to explaining why they, too, are like Joe. It's all part of a concentrated attack on Obama as not just a tax raiser, but someone whose policies are socialist. McCain never utters the S-word himself. That's left to his running mate. CLAIBORNE: But these days, Palin may be a damaged carrier of the McCain message. CHIP REID: ...Over the last month, 23 percent of voters say their opinion of McCain has gotten worse. Why? 32 percent of those blame his attacks on Obama. Late today McCain added a new attack to his stump speech, seizing on a recent remark by Obama running mate Joe Biden who suggested that foreign powers would create an international crisis to test the mettle of a President Obama. JOHN McCAIN: We don't want a President who invites testing from the world in a time when our economy is in crisis and Americans are already fighting in two wars. ANDREA MITCHELL: ...Sunday McCain's long-time friend Colin Powell endorsed Obama and criticized the choice of Sarah Palin. COLIN POWELL, ON MEET THE PRESS: I don't believe she's ready to be President of the United States, which is the job of the Vice President. MITCHELL: Powell could boost Obama's foreign policy credentials. But today the McCain camp seized on something Joe Biden said, that Oama would be tested in his first months in office. 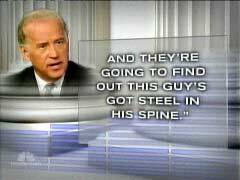 AUDIO OF JOE BIDEN: They're going to want to test him, just like they did young John Kennedy. They're going to want to test him. And they're going to find out this guy's got steel in his spine. JOHN McCAIN: We don't want a President who invites testing from the world at a time when our economy is in crisis. "John McCain represents the best of America's past, and Barack Obama the hope of the future -- the hope of a country that can make big changes and live out one of its greatest promises, of equal opportunities for all Americans, of every caste, creed and color. And America has always been a country that looks forward. So, I will be voting for Barack Obama on election day this year." The Editor of Newsweek International was more explicitly hostile to McCain and Palin in the October 27 domestic edition of Newsweek where, in a piece titled "The Case for Barack Obama," he made clear his disagreement with conservative policies and his left-wing view of past campaigns. 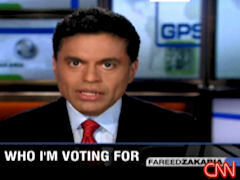 In the magazine article, Zakaria decried winning GOP campaigns: The 1988 campaign "when the Pledge of Allegiance, Willie Horton, flag factories and Belgian endives dominated" and expressed thanks for "the relatively brief appearance of William Ayers" this year compared to "the barrage of Swift-Boat attacks on John Kerry" in 2004. He hailed McCain's "courage" -- for going left in three of four areas cited by Zakaria: "He has broken with his party and president on global warming, campaign finance, government spending and the use of torture." Zakaria dismissed McCain's conservative policy positions: "His responses have been a recitation of old slogans -- cut taxes, limit the government, cut spending -- that are largely irrelevant to today's problems." In contrast, Zakaria praised Obama for not being "constrained by the fear of seeming liberal" and going to the left of Bill and Hillary Clinton: "Obama's broader economic agenda -- health-care reform, infrastructure investments and a major push for alternative energy -- are large solutions to the growing problems of our times. They are not radical, but neither are they overly constrained by the fear of seeming liberal. Bill and Hillary Clinton were always careful not to stray too far from the country's comfort zone. Obama is pushing to change the parameters of that zone. That's leadership...."
John McCain is brave, and this courage has manifested itself not simply in the prisons of Vietnam. Over the past two decades he has broken with his party and president on global warming, campaign finance, government spending and the use of torture. He has chosen, for the most part, to forgo the racial coding that the Republican Party had used for decades in its campaigns. But despite these tremendous strengths, as a candidate for president in 2008, he is the wrong man for the wrong job at the wrong time. He apparently wanted to name as his vice presidential candidate Joe Lieberman, a pro-choice semi-Democrat with decades of experience, but then instead picked someone close to the opposite -- Sarah Palin, a rabble-rousing ultraconservative with limited experience and knowledge of the issues. [S]ymbolism is also a powerful force in human affairs. Imagine what people around the world would think if they saw America once again inventing the future. And imagine how Americans would feel if they saw their country once again fulfilling its founding creed of equal opportunity, if they saw that there really were no barriers in their country, not even to the highest office in the land, not even for a man with a brown face and a strange name. I admit to a personal interest. I have a 9-year-old son named Omar. I firmly believe that he will be able to do absolutely anything he wants in this country when he grows up. But I admit that I will feel more confident about his future if a man named Barack Obama became president of the United States. Costello's report, which began 40 minutes into the 7 am Eastern hour of the CNN program, was the first in a week-long series of reports by the network called "Count the Vote," which aims at "investigating potential problems in key battleground states" with the voting process, as co-host Kiran Chetry put it in her introduction to Costello's report. Both Chetry and Costello iterated the Michigan Democrats' contention in three slightly different ways at the beginning of the report. It's based on a supposed quote by Macomb County, Michigan Republican chairman James Carabelli in the Michigan Messenger, a liberal website (Costello actually described it as such). The CNN correspondent interviewed two couples, the Monacos and the Wards, who lost their homes in the Michigan county who repeated the Democrats' accusation. She then reported how "Michigan Republicans say the Monacos and Wards should not worry. They say Carabelli was misquoted in the Michigan Messenger, and they're now suing the online publication for defamation." Costello tried to interview Carabelli for her segment, but he apparently didn't return her calls. At no time did she try to verify if the two couples are still living in the same voting precinct so that they could still vote, a detail mentioned by Costello near the end of her report. At the end of the segment, Costello reported that the state Democratic party and the Obama campaign had "gone to federal court asking for a restraining order to keep Republicans from using foreclosure lists alone to disqualify voters." But she then continued with another Democratic "fear:" "But Democrats fear Republicans will still challenge voter eligibility based on address, and of course, that could slow the voting, forcing some voters waiting in line to give up and go home." When Chetry asked about the Republicans' denial of the Democrats' accusation, she repeated how "Mr. Carabelli said he was misquoted, but when we -- when we asked to hear more from him, he declined interview." So did Carabelli fail to return calls, or did he actually decline the interview? KIRAN CHETRY: Welcome back to the most politics in the morning. With huge voter turnout expected on Election Day, we're looking out for your vote. All this week, we're investigating potential problems in key battleground states. It's a series of reports we are calling 'Count the Vote,' and today our focus is on foreclosure victims in Michigan. Democrats in the state are claiming that Republicans want to find voters who have been booted from their homes to then be booted from the ballot box as well. Our Carol Costello is live in Washington with more for us this morning. Hey, Carol. CAROL COSTELLO: Hi, Kiran. You know the fear is Republicans will use those foreclosures lists to prove registered voters are ineligible because their addresses don't match where they live now. Democrats call that unbelievably cruel. UNIDENTIFIED WOMAN: 53608 Christie Drive. COSTELLO (voice-over): Lost your house to foreclosure? Democrats in Macomb County, Michigan, say beware -- Republicans, they say, want to make sure you lose your vote, too. MARK BREWER, MICHIGAN DEMOCRATIC PARTY CHAIRMAN: They've made that political calculation that, by and large, they don't want those people voting because they they're going to vote for Barack Obama. COSTELLO: The hullabaloo started when reporter Eartha Jane Melzer of the liberal Michigan Messenger web site quoted Macomb County's Republican chair James Carabelli: 'We will have a list of foreclosed homes and will make sure people aren't voting from those addresses.' Democrats fear Republicans on Election Day will challenge voters whose addresses don't match where they live now -- like people who had been kicked out of their homes due to foreclosure. How many could that be? Macomb County Clerk Carmela Sabaugh, a Democrat, adds a dot for every home foreclosed in her county. There are 5,090 of them. One of those dots represents what happened to the Monacos. We caught up with them at what was their dream home. TONY MONACO, BANK FORECLOSED ON HOME: I can't believe it's even happening. COSTELLO (on-camera): Are you going to go to the polling station? MONACO: You bet -- yes, I am. Yes, I am. PEGGY MONACO, BANK FORECLOSED ON HOME: I think they're trying to kick you when you're down. It's not bad enough that you lose your home. COSTELLO (voice-over): The Wards also lost their home to foreclosure after payments ballooned. JENNIFER WARD, BANK FORECLOSED ON HOME: You're down, you're depressed about it, you go through a lot of lows, and then for somebody to come and challenge you when you go in to vote because you actually feel like that you can make a difference -- I just think that's wrong. COSTELLO: Michigan Republicans say the Monacos and Wards should not worry. They say Carabelli was misquoted in the Michigan Messenger, and they're now suing the online publication for defamation. The reporter stands by her story. 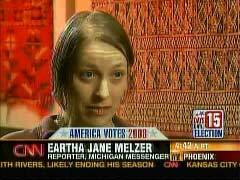 EARTHA JANE MELZER, REPORTER, 'MICHIGAN MESSENGER:' Right. I spoke with Carabelli myself, and I have total confidence in what he told me. I have clear notes of our conversation. There's no doubt about that. COSTELLO: CNN tried to talk to Carabelli, but he did not return our calls. The state GOP declined an interview. In the meantime, the county clerk says a foreclosure list alone isn't enough to prevent someone from voting. CARMELA SABAUGH, DEMOCRAT, MACOMB COUNTY CLERK, MICHIGAN: You do not have to own a home to vote. So if your house is foreclosed on, you have every right to vote. COSTELLO (on-camera): That's right. If you have been forced to leave your foreclosed home and you live in a different house in the same precinct, you can vote. You are still eligible. Michigan Democrats and the Obama campaign are taking no chances though. They've gone to federal court asking for a restraining order to keep Republicans from using foreclosure lists alone to disqualify voters. But Democrats fear Republicans will still challenge voter eligibility based on address, and of course, that could slow the voting, forcing some voters waiting in line to give up and go home. Kiran? CHETRY: But Carol, to be clear, the Republicans are saying they have no plans to do that and that this one person who claimed he was going to do that was misquoted? COSTELLO: Mr. Carabelli said he was misquoted, but when we -- when we asked to hear more from him, he declined interview. CHETRY: All right. Interesting piece, and we look forward to more of them. Carol, thanks so much. On Monday's Good Morning America, in a fact check of John McCain's statement that Barack Obama "gives away your tax dollars to those who don't pay taxes," reporter Jake Tapper cited the Tax Policy Center's analysis of the McCain and Obama tax cuts to stamp McCain's charge "false." Tapper: "Obama's tax cuts only go to people who work, so by definition, it's not welfare. Some working people eligible for Obama's tax cut make so little, they do not pay income taxes. But they do pay payroll taxes and other taxes." But Monday's piece illustrated the liberal media's penchant for analyzing tax proposals according to a liberal yardstick -- who gets how big a check from the government -- rather than by analyzing how the rival tax policies will contribute to greater prosperity (by helping or hurting economic growth, rewarding or punishing job creation, etc.). While the media are always checking to see how the candidates "spread the wealth," they seem not to care if a candidate will help expand the economic pie and make us all wealthier in the long run. It also marked the fifth time in five months that Good Morning America has cited the liberal Tax Policy Center (an offshoot of two liberal think tanks, the Brookings Institution and the Urban Institute), while conservative tax experts at the Heritage Foundation have never been cited. Senator McCain's plan is substantially better at spurring economic growth than Senator Obama's. This is not surprising, since Senator McCain focuses on economic growth and job creation, while Senator Obama focuses on redistribution of income....Each presidential candidate achieves his stated goal, with Senator McCain generating the most new jobs, growth, and additional income for individuals. Senator Obama's plan drives up the tax rate for individuals with annual incomes above $250,000 and redistributes money to workers with lower incomes. Wouldn't it be fair to have the conservative analysis appear at least once alongside the liberal analysis of who gets what? JAKE TAPPER: How about this charge from McCain? SENATOR JOHN MCCAIN: His plan gives away your tax dollars to those who don't pay taxes. That's not a tax cut. That's welfare. TAPPER [Big red "FALSE" stamp appears onscreen]: That's false. Obama's tax cuts only go to people who work, so by definition, it's not welfare. Some working people eligible for Obama's tax cut make so little, they do not pay income taxes. But they do pay payroll taxes and other taxes. Here are some tax facts. 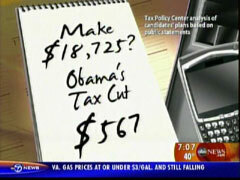 [Onscreen graphic for source: Tax Policy Center analysis of candidates' plans based on public statements.] If you make up to $18,725, McCain will give you a tax cut of $65, while Obama will give you $567. If you make between $37,000 and $66,000, McCain would give you half of what Obama would. $66,000 to about $110,000 a year, McCain gives you a $1,487 tax cut. Obama will give $1,264. But here's where the starkest differences come in. If you're in the top one percent, making between $602,000, to $2.8 million, McCain gives you a $109,214 tax cut on average. Obama would raise your taxes on average by $121,689. Those figures are for 2009 and, of course, they're just generalities. We have more detailed information at ABCNews.com. Now, some of the key findings of the Heritage Foundation analysis of the two tax plans, authored by William Beach, Karen Campbell, Rea S. Hederman, Jr., and Guinivere Nell and released Wednesday. The quotes are all directly from the report, but I've re-arranged the paragraphs and added headings so that the McCain and Obama proposals can be more easily compared. My summary of their findings: Compared to Obama, McCain's plan adds an extra $100 billion to GDP over the next ten years, more than one million additional jobs, much higher disposable income for a family of four, and a far greater personal savings rate. MCCAIN PLAN: GDP will be, on average, $283.7 billion higher over the 2009 to 2018 horizon. Real (inflation-adjusted) GDP growth is between 0.2 and 0.5 percent higher than the baseline. The expansion in the U.S. economy is largely due to the incentives to save and invest in productive capital and technology through reductions in capital gains and dividend taxes, and accelerated expensing of depreciation for capital purchases. These incentives are enhanced by a substantial reduction in the tax rate on corporate income, which lowers consumer costs and allows corporations to expand their investments. OBAMA PLAN: GDP grows due to increased consumption. The level of output in the economy as measured by the GDP jumps by an average of $101.7 billion (after inflation) in Obama's plan. By 2018, the difference between baseline and the forecast is $187.2 billion in additional output, or about a 1.2 percent increase in the level of GDP. Nearly all of this increase stems from personal consumption expenditures. The consumption of households grows by an average of $146.9 billion, and government consumption expands by $6.6 billion. Indeed, household consumption outlays jump by $235.2 billion above baseline in 2018, and over the entire 10-year period average $146.9 billion above what they would have been without Senator Obama's plan. Net exports, however, fall by an average of $59 billion, indicating that imports (which subtract from GDP) grow more rapidly than exports did in his plan. Gross private domestic investment increases by an average of $4.2 billion. MCCAIN PLAN: Total employment increases an average of 2.13 million jobs over the next 10 years. Peak job increases over the baseline are 3.4 million additional jobs in 2018. The difference between the number of jobs Under the McCain plan and the baseline increases each year. The corporate income tax reductions and the incentives for saving and investment allow business owners to expand their operations and increase their investment in new equipment. Investment leads to expanded output that, in turn, increases personal incomes and employment. OBAMA PLAN: Employment grows modestly. The Obama plan encourages job growth principally through boosting consumption. Average job increases equal 915,800 over the 10-year period. Private-sector employment averages 814,700 additional jobs. The difference between the two results equals public-sector employment growth above the baseline, or an average of 101,100 new government jobs per year. These numbers would have been bigger had the Senator not raised tax rates on upper-income taxpayers. MCCAIN PLAN: The McCain tax plan is projected to increase a person's disposable income as much as $2,438 above the baseline. A family of four is projected to have $9,750 more disposable income than the current baseline and an average of $5,138 more after-tax income than the baseline over the next 10 years. OBAMA PLAN: Senator Obama's plan extends the Bush tax reductions for taxpayers with adjusted gross incomes below $250,000 a year, and this "hold harmless" provision in his plan causes higher after-tax incomes. For a family of four, disposable income (after inflation) rises by an average of $3,631 over the forecast horizon. By 2018, after-tax income has increased by $5,620. MCCAIN PLAN: McCain's tax plan provides support for greater levels of personal savings, a particularly important development given the tsunami of entitlement spending expected over the next five decades. The personal savings rate is 2.5 times higher than the baseline. In 2018, for instance, the baseline requires a personal savings rate of 2 percent of income. The McCain plan raises the rate to 4.9 percent of personal income. That increase in the rate translates to substantial increases in total savings. The baseline forecast requires an annual average level of personal savings of $3.1 billion (after inflation). The McCain plan raises that annual average to $212 billion, or a 68-fold increase over baseline levels. OBAMA PLAN: The modest boosts to income stemming from the extension of the Bush tax reductions in Obama's plan lead to increased savings. Personal savings increase by an average $135 billion (after inflation) between 2009 and 2018. With 18 days to go in the presidential race, Friday's Today show lurched to the far left and actually devoted five minutes (and space on MSNBC.com) to leftist author Naomi Wolf and her theory that under President Bush, America is undergoing a "fascist shift." Co-host Meredith Vieira treated Wolf with skepticism, questioning her assertions that we're in danger of a "police state," or a standing army overlooking American citizens, suggesting she might be "fear-mongering" to get Barack Obama elected with theories of a McCain-Palin police state, just as the McCain campaign has been accused of exploiting fear. But if years ago, an author suggested President Clinton was leading us into dictatorship, would NBC offered them five minutes, or simply ignore it as undignified? Vieira offered Wolf a free pass to offer long passages of her argument, and the word "fascist" wasn't used by either party, as Wolf presented herself as a nonpartisan and non-ideological defender of the Constitution and the Founding Fathers. Conservative authors are rarely publicized on NBC. One conservative author the Today show has repeatedly featured is Ann Coulter, and like Coulter, Wolf was promoted as "controversial." But there were no angry words from conservatives thrown in Wolf's face, and certainly no one in the Bush White House offering the mildest protest to the notion that they're crushing American democracy under their boots. The book is titled Give Me Liberty: A Handbook for American Revolutionaries. Throughout the segment, NBC's screen offered the promotional message: "'Give Me Liberty,' What Would The Founding Fathers Do." MEREDITH VIEIRA: Author Naomi Wolf is often controversial and she says the country is taking a dangerous turn today. Now in her new book, Give Me Liberty: A Handbook For American Revolutionaries, she urges Americans to quote, "take over the battle by protesting, running for office and asking themselves what would the Founders do?" Naomi Wolf, good morning to you. NAOMI WOLF: Good morning, Meredith. VIEIRA: Let's get right to this. You talk about this battle, that you're calling for. Who are Americans supposed to be fighting and why? WOLF: Well they're supposed to be fighting for the Constitution, the Bill of Rights. And why, because we have something very precious in this country that is under threat and people all over the world envy America because we have this beautiful system of checks and balances and beautiful respect for the law. It is being systematically undermined. So what I'm calling for people to do is to stand up as the Founders intended them to, to defend the Constitution. VIEIRA: So what do you want them to do precisely? WOLF: Well first they have to recognize what's under threat. I've argued what we're seeing today is ten clear signs of a closing society. Everything from warrantless wiretapping, to the state legalizing torture, to you know very disturbing deployments like the First Brigade being deployed in the United States, which overturns 200 years of our being protected by the Founding generation. VIEIRA: But can I stop you right there? VIEIRA: Because we actually did talk to the people at North Com, which is what you're talking about, this brigade that you say is gonna be used against the American public. And they denied that. The spokesperson said, "This response force will not be called upon to help with law enforcement, civil disturbance or crowd control, it will be used to support lead agencies involved in saving lives, relieving suffering and meeting the needs of communities affected by weapons of mass destruction." So they're saying, what you're claiming is just not true. WOLF: Well again, Meredith, I didn't say that the First Brigade would be used against American citizens. What I do know is that history shows that it's very dangerous for there to be a standing army not answerable to the people. And this is why the Founders made sure that the National Guard are answerable to the governors. Now the 2007 Defense Authorization Act made it possible for the President to declare a state of emergency and to deploy the National Guard himself and tell Congress about it after the fact or now to deploy the First Brigade. And what I'm saying is that the Founders understood that this is very dangerous. They knew from experiencing George the Third's mercenaries in their midst that it's very important for the people doing the policing to be members of the local community, responsive to the local community. But these are just some examples. I mean the people I have met across the country are really feeling worried. They think it's un-American for our brave servicemen and women to have their personal phone calls wiretapped. They often feel like, you know, they, they reach out to Congress, they call Congress but they feel that Congress is no longer able to respond to them because of the stranglehold of special interests. They feel like the media often doesn't pay attention to concerns they think are urgent. Among other things, neither of the presidential candidates is addressing the shredding of the Constitution. So the Founders really called on us, at a time like this, to ask each and every one of us to stand up to restore the Constitution and make sure. VIEIRA: But where, when is it standing up and when is it fear-mongering? When you say something like, "The coming American police state. That, that's what's gonna happen to America if John McCain and Sarah Palin are elected." That is a very strong statement. The Republicans have been accused of using scare tactics to make sure that Obama is not elected. You're a supporter of Obama. It sounds like you're doing the same thing to make sure he is elected. WOLF: Well Meredith, respectfully, I urge people watching and listening to go to the article that I wrote. Because this is not a partisan issue. These concerns about subverting checks and balances, they are as dangerous if Barack Obama has these powers or Hillary Clinton as John McCain. What I said and this is, you know, I've been saying to audiences across the country that even if McCain is elected we need a citizens movement, a bipartisan movement to restore the Constitution and, and take back these horrible laws, giving the President so much power. Because what I'm, the point I'm making is with a surveillance society, Meredith, you know it's just literally the case that, from now on, who's ever in power -- John McCain or Barack Obama -- they'll be able to read the strategy memos of the challenger, you know while it's still in the computer. And that is not a real democracy. Our Founders intended there to be a real democracy with transparent accountable elections, in which every vote is counted. And which, you know, there isn't a gang of people on either side who's able to wiretap the opposition, torture prisoners, strip people of habeas corpus and these are core American values. VIEIRA: Alright Naomi before I let you go, I know that you feel that you, your privacy has been invaded because of saying this stuff. So, I don't know, I guess some people might say that you're paranoid but just because you're paranoid doesn't mean they're watching you, doesn't mean they're not watching you. WOLF: Well you know my own, what I'm experiencing in terms of mail tampering and the police report I filed, you know, these are trivial compared with other, other citizens are experiencing across the country. And again it's not a left, right thing. Conservatives, libertarians. I just heard last night from a brave young man, I'm sorry, Morgan, 24 who was an Iraq vet. And Iraq veterans were protesting at the debates just this week and the police rode a horse into the crowd and trampled this young man's face and you know didn't get a medical care. I'm hearing from activists across the country that people, you know, two nuns were put on the Maryland terror list. And we could go on and on. VIEIRA: We could, we could continue talking, absolutely Naomi. I've run out of time, I apologize. VIEIRA: Naomi Wolf, thank you. The book is called Give Me Liberty. Very controversial book.